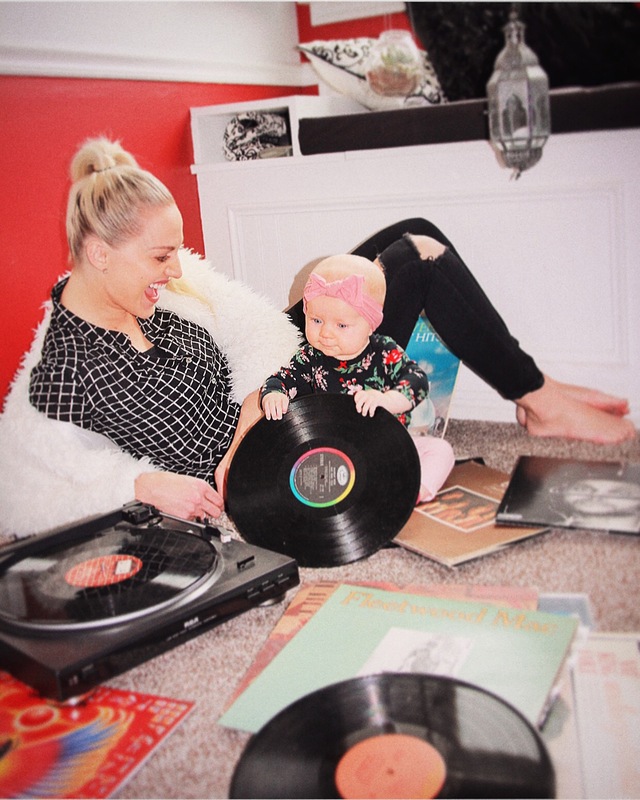 The other day I thought it would be so cute to take pictures with Olivia playing with some records. She loves music these days! She is so funny, every time I sing and dance for her she rocks back and forth, clasps her hands and just giggles. It is sooo sweet! I hope she always thinks I am a great singer and dancer haha I know that isn’t realistic because I am probably the most embarrassing performer haha I have zero talent when it comes to the music industry! The other day I had a huge to do list but Liv was having one of those “needy” days where she just wanted my attention all day. She didn’t want to sit and entertain herself she wanted to see ME. Touch my face, feel my kisses and grab my hands. So I ripped up my to do list and did just that. 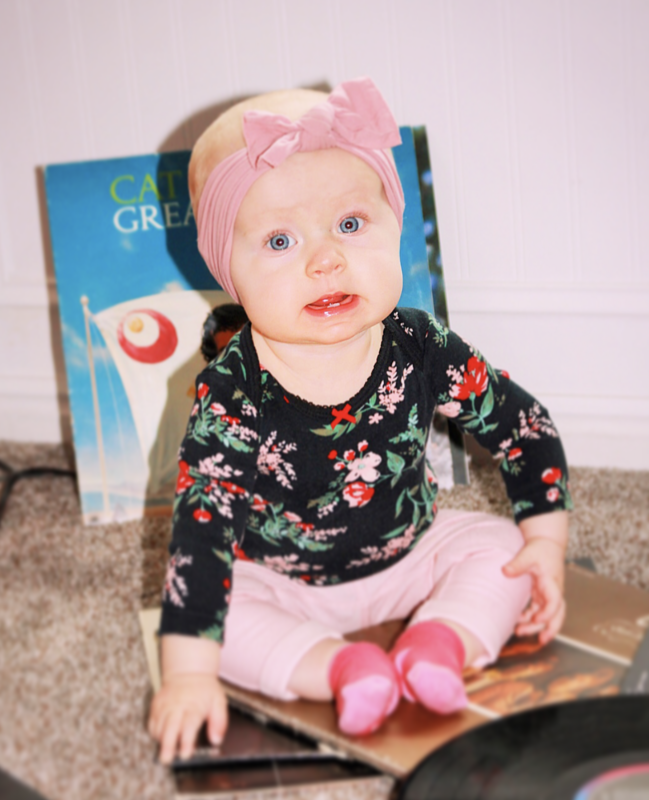 I know that can’t always happen but what a blessing it is to be able to forget about the chores and just focus on my little girl. I LOVE that she wants to spend time with me so I want to take advantage of that. It is okay as mothers if we don’t get everything checked off our list everyday. It’s important for me to remember that success comes from making others feel noticed, loved & appreciated ESPECIALLY when it comes to our children and spouses. So don’t feel bad if your hair is a mess, the house isn’t picked up or if you had to pick up McDonald’s for dinner. Are your kids smiling? Does your husband feel loved and appreciated? If yes, than your day was a TOTAL success! While Liv and I eat breakfast I try and have something inspiring playing in the background. Yesterday we listened to a talk by Sharon Eubank titled TURN ON YOUR LIGHT (Click HERE to listen to it) I feel like this talk goes so well with who I am aspiring to become in 2018 and aligns perfectly with the goals I set (You can read my goals HERE) She basically mentions 5 things we can do as women to impact the world. Be articulate: Be able to express how you feel and why. By having a clear understanding of what we believe in and who we want to represent we can clearly explain why we do certain things. We can be an example to others and answer their questions when asked why we do or don’t do certain things. Be different: I believe when we are trying our best to do what is right and be a light to others we will be blessed with an insight or an alternative solution on how to meet the needs of those around us. Stand out by being kind, loving, and outward looking. Be distinct: Take the time to develop and recognize your skills. What do you have to offer? Use your hobbies and interests to serve and help those around you. Be Happy: That doesn’t mean slap a fake plastic smile on your face. But it does mean living righteously and doing your part to help lift those around you. President Gordon B. Hinckley said it best, “You don’t build out of pessimism or cynicism. You look with optimism, work with faith, and things happen.” There is an energy that comes from happiness and optimism that doesn’t just bless us, it builds everyone around us. Anything you do to light real happiness in others shows that you are doing your part to make this world a brighter place. What are some things you guys do to make the world a better place? It’s Time to Trust Yourself Again.